THE MARTINI CHRONICLES: 4 Tips to Help You Shine At Your Next Conference! 4 Tips to Help You Shine At Your Next Conference! Greetings Divas! 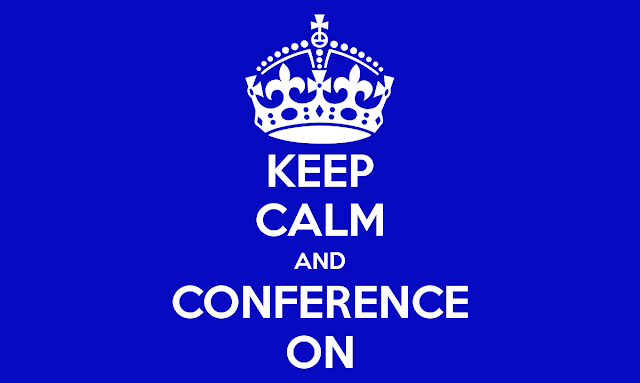 So...it's the beginning of the year, and I know that many of you are mapping out your conference plans for the year. Some of you are planning to attend one or more conferences related to your respective industries. Some may be attending organizational conferences, or conferences related to your hobby. In any event, conferences are a great way to meet and interact with like-minded individuals. It is also a great way to create and maintain business relationships, exchange new ideas, and network with and enjoy the company of other conference-goers. Over the years, I have been to many professional and personal conferences, and there are a few key things that hold true across the board. Being that I am on a never-ending quest to share my unsolicited insight on issues that are of interest to professional women, I have selected four quick tips that will help you to shine at your next conference...based on my own experience of course! I'm sure each one of these is worthy of its own separate post, but I wanted to briefly hit each one in a single post. Check them out, and let me know what you think in the comments. Happy conferencing! Tip #1. Scope Out Attendees Before the Conference (If Possible) - Many conference organizers will release the list of conference attendees prior to the start of a conference. If this is a business-related conference, the list may provide the attendees' name, company, and position. Before heading to the conference, take a good look at the list and make a note of those individuals you would like to connect with at some point during the conference...for any reason. You may want to introduce yourself to someone who you would like to be in business with, or reacquaint yourself with someone(s) you've worked with in the past. Perhaps you want to reach out to someone ahead of the conference and plan to meet for lunch, dinner, or coffee while at the conference. The key here is to be aware of who is going to be in attendance, and to create a plan to connect with your counterparts. Be Yourself - By far the most important thing to do! You are fabulous, and should share your fabulousness with others. Be confident in your presentation of yourself. Work the Room – Try to speak with a wide variety of individuals. 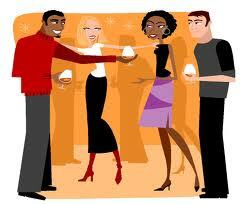 While you should greet and catch up with those you know, try to meet 5 to 8 new individuals each day of the conference. Be an Active Listener – Don’t just look like or pretend you’re listening to someone; actually listen to the individual actively. Make eye contact and ask follow up questions. Show genuine interest in the speaker. Believe me, people can tell when you’re not engaged. Tip #3. Slay the Business Card Exchange - It goes without saying that you should bring a stockpile of business cards with you to the conference; and you can bet that other conference-goers will have their cards as well. Be sure to keep your cards where you can access them quickly: in your pocket...in a business card holder in your purse...somewhere that doesn't require you to search for it when needed. One thing I like to do is keep about 15 of my cards behind the "Hello, My Name Is" badge that conference organizer give out in the conference swag bag. Why? It's always with you, and it's front and center when you need it. It can also serve as a place to keep the business cards you collect from other attendees. While we're talking about business cards, please remember to make a quick note on the back of business cards you receive from others so that you remember the conversation. You should also note any follow-up comments. This will be very important during Tip #4 below! Go through your business cards and follow up with these individuals. Send personalized "a pleasure to meet you" emails, and be sure to include any specific information each individual may have requested. For example, someone may have asked for a proposal of your company's services...be sure to include the proposal in this email. In any event, be sure to follow up and make an effort to keep in touch. Perhaps via LinkedIn! Go through any of you other notes and follow up as appropriate. Maybe you wrote something down that you heard during a conference session that prompts you to do some research. Maybe you need to set up an internal meeting to discuss new information related to your industry. Whatever it may be, take the time to incorporate the things you have learned at the conference. I'm sure there are many other things that you can do to rock out at your next conference. Leave some additional tips in the comments below. What are your go-to moves when attending an industry conference?